Malaga airport is located about 6km (about 4 miles) from Malaga city centre and a short drive from any of the Costa del Sol’s major resorts. It is also within easy driving distance of Granada (80 miles approx’) Cordoba (83 miles) Cadiz (100miles) and Seville (95 miles) The airport is well sign posted and routes in and out are being improved along with the airport extension which is due to be completed in 2010.The airport handled about 13 million passengers during 2007 and this figure should increase greatly when the new terminal is finished. At present the airport has two terminal buildings which are connected internally. Terminal 2 handles most international and domestic flights with terminal 1 responsible for flights from outside the European Union and flights diverted from terminal 2 during busy periods. Malaga is one of the busiest in Spain with flights arriving from over 120 destinations all over the world. This figure includes flights from 23 U.K airports 17 in Spain 10 in Germany as well as airports in Ireland, Russia, Saudi Arabia and the U.S.A. Most major airlines such as British airways, Air France, Iberia and Delta have scheduled flights to Malaga as do many budget airlines like Easyjet, Ryanair, Airberlin, Flybe and Thompsons making Malaga one of the easiest and cheapest places to fly to. Malaga probably has more car hire companies based in or around the airport than any other airport in Spain, so due to the huge amount of competition some excellent deals can be found. Most of the major players in the industry have offices here but often better offers can be found from smaller local companies who can also offer a better more personal service, such as Malagacar.com. There are also many internet brokers who offer car hire but remember that they do not have their own fleets and so often the prices are higher than booking direct with a local company. Hiring a car is surely the best way of getting around Malaga and the Costa del Sol as there are many places than can’t be reached easily by public transport and a hire car offers you freedom from times and schedules. Remember we also provide Malaga car hire services. The train station is located opposite the airport and is reached via a footbridge from the terminals. Trains run between the airport and Malaga city to the east and fuengirola to the west. The train service to fuengirola starts at 6.13 am and runs every 13 and 43 minutes past the hour until 10.43pm.The trains stop at Torremolinos and benalmadena stations before reaching Fuengirola.The service to Malaga city starts at 7.15 am and runs every 15 and 45 minutes past the hour until 11.45pm. In order to avoid queues and a poor service, we recommend you to book a transfer from Malaga airport with Malagaholidays.com. Bus stops can be found just outside the arrivals halls at both terminals. For terminal 1 the stop is just outside the exit in front of the taxi rank. For terminal 2 just turn right at the exit and walk about 30 metres. Bus number 19 runs about every 20 minutes from the airport to Malaga the central bus station in Malaga where you can catch buses to most towns and cities in the region. There is also a bus that runs about every 40 minutes from the airport to Marbella. Remember that these buses can get very full during peak times. At the moment there are three main car parks at the airport. Car park P1 is opposite terminal 1.The price is 2 cents per minute for the first 30 minutes, then 3 cents a minute until 60 minutes when it goes down again to about 2 cents a minute. This all means that 45 minutes parking would cost you about one euro. 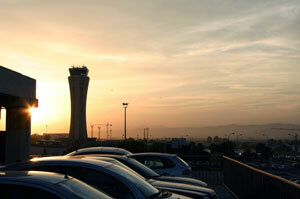 Car park P2 is located almost opposite the departures hall at terminal 2 and has similar prices to those at P1.Car Park P3 is found just outside the main airport and offers free parking. A free bus service operates between the terminal 1 and 2 bus stops and the car park. The buses run every 15 minutes. The airport at Malaga now runs a program to assist disabled users called “sin barreras” or without frontiers, Yellow shirted workers will meet disembarking passengers and help them collect their luggage and leave the airport. 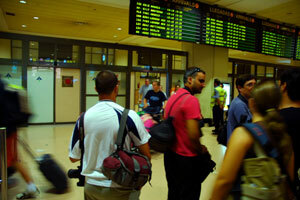 They will also help when passengers arrive to board flights. 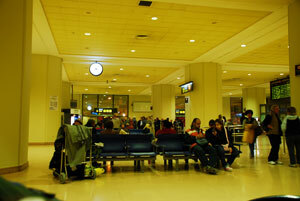 The new terminal T3 at Malaga airport has been inaugurated by the Spanish Kings on March 15th 2010. This new terminal with a glass façade of 225 metres is very distinctive due to its luminous design and high ceilings which facilitate the entry of natural light. The terminal T3 is located next to the old T2 and directly connected with it. All EU flights arrive and depart now from the T3; whereas passengers of non EU destinations will have to check-in in the T2. 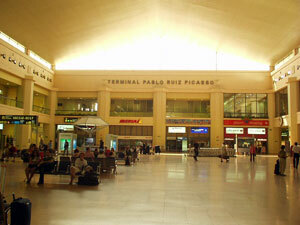 The cargo terminal is located just to the north of the main passenger terminals. It has four cold storage units, areas for handling hazardous and radioactive materials, livestock handling areas, a high security vault and a laboratory for inspections of products for human and animal consumption. This terminal is just to the south of the main passenger terminals and handles all private flights that arrive at Malaga. 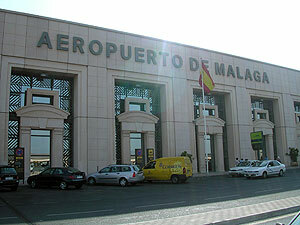 The building was the original passenger terminal at Malaga built in 1948 and renovated to include facilities necessary for a modern terminal. To find further information about flights and statistics, visit Malaga airport official website.